I read this article and found it very interesting, thought it might be something for you. 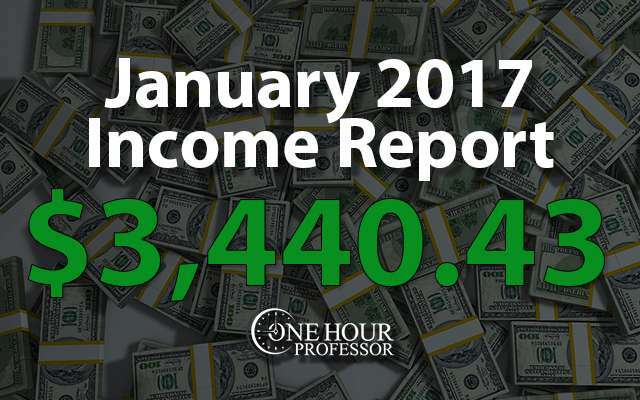 The article is called January 2017 Monthly Income Report and is located at http://www.onehourprofessor.com/january-2017-monthly-income-report/. WANT TO LEARN THE TRUTH ABOUT ONLINE BUSINESS? I’m happy to report that I’ve started 2017 off with a bang. I looked over all of my previous months and it turns out that this is the third best month that I’ve had since starting my online business, which is great because I really didn’t change much to make that happen. 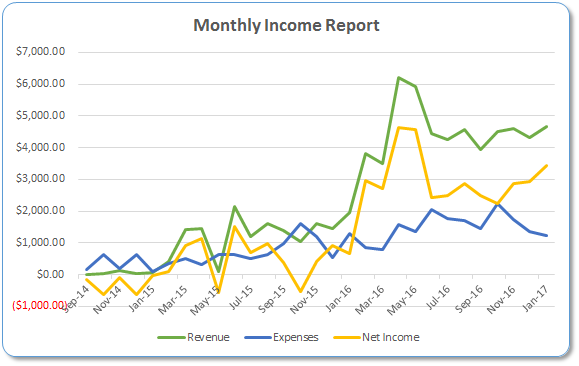 But before I begin the income report, if this is your first time on my website let me explain why I write a detailed income report each month that outlines the money I made (or lost) and the time I spent working each month. 1) I strive to be transparent about what it takes to make money online. 2) These reports help me keep track of my own progress. 3) These reports hold me accountable. In short, I don’t create these to gloat about my earnings. I create them to help you understand the true “earning curve” of online business. Now that we got that out of the way, let’s dive into the report. How did the income report turn out this month? Every month I have income that streams in from multiple sources and quite frankly, a lot of that is pretty regular. However, each month I tend to see a few line items that are drastically different from the prior month. In this section, I’m only going to discuss the items that have increased or decreased substantially. JFTHQ Google Adsense Ad Revenue: This isn’t a new item on the income report, but this was the biggest contributing factor to my increase in income this month. I did notice a nice increase in traffic of about 28% compared to December, but this is expected because December has the holidays. So, I guess we can chalk the increase in revenue up to that and I’m hopeful that income will maintain or continue to increase in February. Authority Website – THQ Google Adsense Ad Revenue: My new authority website increased Adsense revenue by about 50% which is great because that increase is only due to traffic. I didn’t put any additional ads on the website, Google just delivered more traffic. I anticipate that this trend will continue in February. Similar to the income I make every month, there are certain expenses that I consider “fixed”. With that being said, as I did in the income area, I’m only going to discuss the outliers or new items added as expenses. Email Hunter: One of the better tools I found to research backlink targets is Email hunter. This tool automatically finds email addresses on websites and is free for your first 100 contacts each month. However, this tool isn’t free for me anymore because I’m having a virtual assistant do all of my research. I’m a big fan of this tool because it helps my assistant quickly find email addresses that I need to continue my link building campaign for the THQ authority website. Upwork Freelancers: My costs for writers and researchers increased a little bit this month, but I only allowed this to happen because I knew I was getting more revenue than usual. These were all necessary increases and I anticipate that I will increase again in February as I need more content for the THQ website. JobsForFelonsHub.com Update: I’ve been saying for three months that I’m going to optimize this website for revenue and unfortunately, I still need to do this. It sounds like an easy task, but I’m finding this to be extremely difficult. Aside from the fact that it’s a “boring” task, I’ve found that there doesn’t seem to be a great tool to help me do this myself. Consulting Update: There was no consulting income this month. As I’ve said before, not a big deal at all as I prefer to work on my own projects. That being said, I did speak with a new potential consulting client who has their own online business and I prefer these types of coaching session engagements because it’s always fun to talk shop and getting paid for it makes it even better. Udemy Update: The earnings from Udemy seemed to normalize this month. I’m not too sure why December was such a bad month for my course sales, but January bounced back so I’m confident that the reduction was only temporary. OneHourProfessor.com Website Update: As usual, I sold one course on the OHP website and also had significant commissions from Thrive Themes. I need to add some information to my Thrive Themes post as the company came out with some new products and I plan on getting that done this month. Authority Website THQ Update: My new authority website continues to grow and I’m extremely encouraged by the results I’m seeing. I still get a few links per week with my outreach campaign and the traffic and earnings continue to rise. For now, I am going to continue to focus on link building and I plan on customizing my email autoresponder significantly in February. With this website, my email subscribers fall into two different categories and I am going to have the subscribers segment themselves and then send them relevant information using the tagging feature in Convertkit. My plan is to fill my autoresponders with ideas that both of the audiences will appreciate. I’ll have a writer create content about specific subjects and then incorporate them into the autoresponder. The idea is that people will get the email, click through to my website, and then I can profit off of Adsense as well as affiliate commissions. The sessions increased by 190% month-over-month (MoM). That’s……well, it’s simply ridiculous. I know this type of growth isn’t sustainable, but I do think that the sessions will increase quite a bit for the next few months. Google is starting to reward me for all of the backlinks pointing to the website and realizing that it’s a reputable source of information. Every week I’m using Google Search Console and see that my impressions, clicks, and position is increasing. This is exactly what JobsForFelonsHub did at the beginning, so I’m hopeful that the THQ website will follow the same path, even if it’s a bit slower. Referring domains (backlinks) increased by a whopping 91% MoM and though I’m not sure I can sustain this growth, I have a feeling that I can still get quite a few links to this authority website each month. Last month I predicted that earnings would exceed $75 and it the month ended just over $100. This was a nice surprise for me to see and exceeded my expectations. This month I’m going to predict that earnings will be $150 or more and I really hope that happens because it will allow me to increase my content output on the website. January was nothing short of amazing for my new BCC authority website. I have two writers and am publishing 4 blog articles per week. Beyond that, I completed my link building campaign and so far am seeing a 14% success rate for the campaign. In other words, 14 out of every 100 websites I contact are willing to link to me. This may not seem like much, but considering most campaigns are somewhere between 3-5%, this is excellent news. A key thing to note here is that the referring domains number is wrong. I pull this number using Ahrefs and the reason why it’s wrong is because I got a ton of links very quickly with my link campaign. I know for a fact that 40 referring domains have linked to me and to be honest, I don’t think that Google or Ahrefs has figured this out just yet. I’m anticipating a huge increase in traffic once the search engine has realized it, but this could take a month or two before I see the full effects. Every month, I’m going to reflect back and tell you a few different lessons that I’ve learned. My hope is that the lessons each month will be a cautionary tale for you that makes it so that you don’t make the dumb mistakes that I do along the way. Link building is an art: I’ve realized that getting links to my website isn’t easy. For my THQ website I had one link building campaign running that didn’t seem to be getting much of a response, so I revised my messaging and I saw a 5% increase in response rate.. This may not seem like much, but I’m emailing 200-250 people each week so it greatly increases chances of obtaining a link. Unfortunately, a lot of the emails are “no thanks”, but at least it starts a dialog between myself and the contact. This could eventually result in a link in the future. Emails can be exhausting: Building on my last point, though I’m happy to be getting many more reply emails for my link building campaign, it’s exhausting to respond to 75-100 emails every single day. I have heard of people outsourcing email responses before, but I don’t think that’s a good idea at this point. It may change in the future, but for now I’ll keep grinding through my inbox to get all of the emails answered. Google is slow: Admittedly, it’s tough to criticize Google because what the company/search engine is able to do is nothing short of remarkable, but I’ve noticed a trend with both the THQ and BCC websites. Google takes a lot of time to reward you for high-quality and relevant backlinks. I remember feeling a little frustrated with the THQ website because I was getting a lot of links and seeing no traffic increase, and now the exact same thing is happening with the BCC website. The difference is that the BCC website got around 40 good links in a week and a half which is much faster than the growth of THQ. My lesson is that it’s important to be patient with Google. If you get 5-10 awesome links today, don’t expect to see a huge change in your organic traffic for 3-4 weeks. My strategy is replicable: I knew I “struck gold” with the JobsForFelonsHub website because it was so successful, but I wasn’t 100% sure that the process I used there was replicable to other websites. After all, JobsForFelonsHub went viral and after that, it was really easy for me to make money on the website. But could I use the same website building strategy (without the viral boost) and create a profitable website? The THQ website has proven that my strategies work and I am really pumped to keep building other profitable websites moving forward. My eventual goal is to hit $10,000 in income each month by the end of 2017. Did I Meet my Goals for January? Though I saw an increase in income this month, I can’t claim that I was behind it. As mentioned in the report, there was a large traffic increase and that’s what contributed to it. In other words, I was slacking on this one and failed. Though my goal was 15 links, I was actually able to get 21 in January. This was pretty awesome and I worked really hard to make this one happen. Not only am I doing link prospecting, but I’m also using HARO to find opportunities and pitch myself and my business. These pitches are not easy and I’ve gotten better at it with time, so hopefully it will continue to help me build links in February. Truth is, the hardest thing is to ACTUALLY reply to all of the opportunities. I was able to complete my database research as I was hoping, but more importantly is the fact that I was able to launch my link building campaign as well. It started pretty ugly when I received an unfavorable email from 1 of my first 3 recipients, but I used that email full of criticism to learn and readjusted my messaging. Because of that, I was able to get a 14% success rate that is still improving. Putting this one on my task list….again. I NEED to figure this out and I’ve been lazy because, well, I hate the task. But February is the month….dammit! Since I hit 21 links to the THQ authority website in January, I’m setting my goal for 20 this month. I’d love to push for 25 but I don’t think it will be possible, so I’ll stick to 20 and see if I can make it happen. The THQ website desperately needs a good autoresponder, so my goal in February is to complete it. I probably won’t be able to complete the whole thing as I’ll still need content from my writers, but I want to get it to a point where I have the start figured out and can easily add to it as time goes on. What are your goals for the month? What questions do you have? Let me know in the comments below! Your monthly report is the first thing I read when it arrives in my email. Always informative giving both the good and the bad. I Don't Want to Know.